Diesel Generators with slow-speed engines (1500 rpm at 50 Hz and 1800 rpm at 60 Hz) are designed for continuous power supply or for standby power. 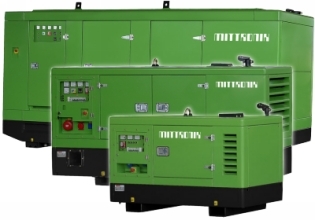 Depending on the required generator power reliable diesel engines of various well-known manufacturers are used. The production capacity is about 40.000 units per year. 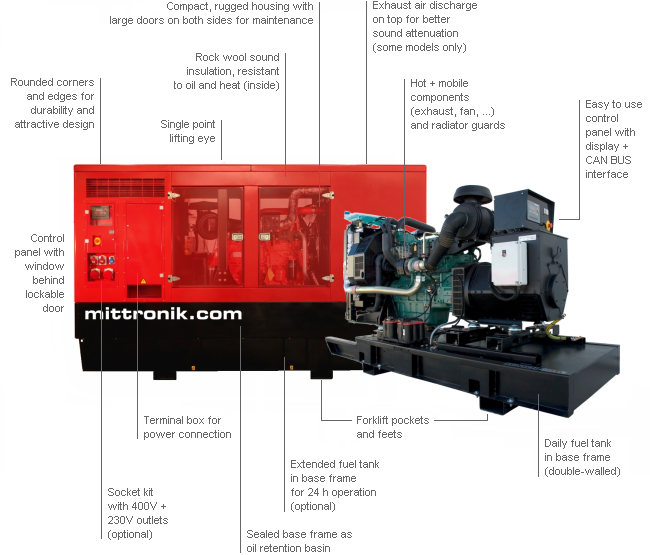 All generators are manufactured to ISO 9001 in different European locations. 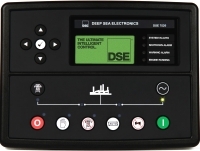 The digital state-of-the-art generator set control panels are easy to use. Various engine and generator control sensors and saftey switches protect the power generator set (GenSet) with visual and acoustic alarm or emergency shutdown. 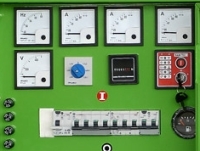 Digital control panel with LED indicator for operationg status of the power generator set. Analog display for voltage (V), current (A), frequency (Hz), operating hours and fuel level on the control panel. Digital control with display and buttons to operate the power generator set. Display of all generator and engine parameters (and mains/grid power). We are available for consultation or for more information. Contact us !